When thinking about motor racing it is too easy to sneak the word 'crashed' into a review, but that is basically what these Chips did. One bite and the Chip shattered into pieces like a windscreen. There was nothing crunchy and everything munchy about them. 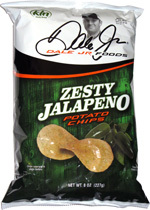 This particular Chip had more character than the others in Dale Jr's range. Although they were similarly flat, with less oil bubbling than we would like, to enable us to give higher marks for a characterful texture, there was at least some color and seasoning visible. Alaska Chips have their Volcano Chips, Zapp's have their Voodoo Chips. Dale Jr has Creole & Green Onion. We would have preferred the Barrel O' Fun guys that make Dale's Chips for him, had invented a crazy name for this flavor. As it was, we were left hunting around for the alleged ingredients individually. There was a creamy potato, salty and spicy onion, plus a sweetness, but we couldn't really describe the flavor as Cajun & Green Onion. It is difficult to put up a comparison, but suffice it to say, we love an original tasting Chip, even if we don't love it. If you know what we mean!